Halfway through November already! This weekend is full of Fall fun from free movies in the park, festivals, Christmas trees, visits with Santa, and other holiday fun! Remember, some of these activities may require registration. Always check with the organizations for the most updated information or if you have any questions. We appreciate the shares and likes. If we're missing something, let us know! 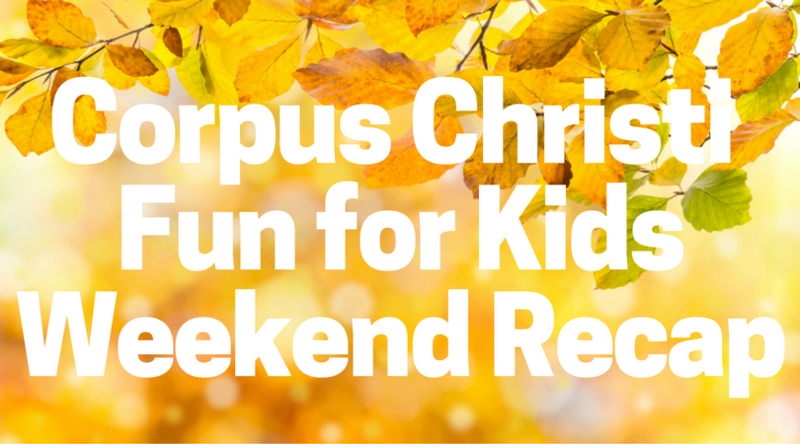 Compiling this information takes work, please credit or link back to Corpus Christi Fun for Kids when sharing. This smash off-Broadway hit takes you to the 1958 Springfield High School prom where we meet Betty Jean, Cindy Lou, Missy, and Suzy, four girls with hopes and dreams as big as their crinoline skirts! As we learn about their lives and loves, the girls serenade us with classic ‘50s hits including “Lollipop,” “Dream Lover,” “Stupid Cupid,” and “Lipstick on Your Collar.” In act two, the Wonderettes reunite to take the stage and perform at their ten-year reunion. We learn about the highs and lows the girls have experienced in the past decade and are charmed to find that no matter what life throws their way, they will conquer it together. Featuring over 30 classic ’50s and ’60s hits, The Marvelous Wonderettes will keep you smiling in this must-take musical trip down memory lane! Cost: Tickets are $16. Buy them online. Discounted tickets for children available at box office at 361-851-9700. Y’all are invited to the museum to journey back in time! Discover the wild and amazing origins of modern Texas. 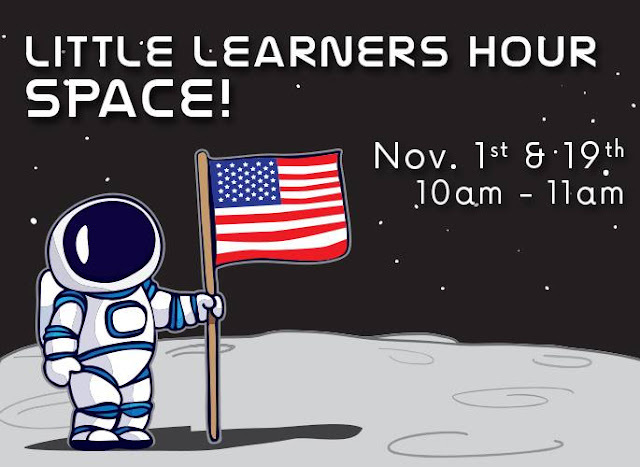 Cost: $5 for members, $10 for non-members, Parents pay general admission. Pre-registration is required. 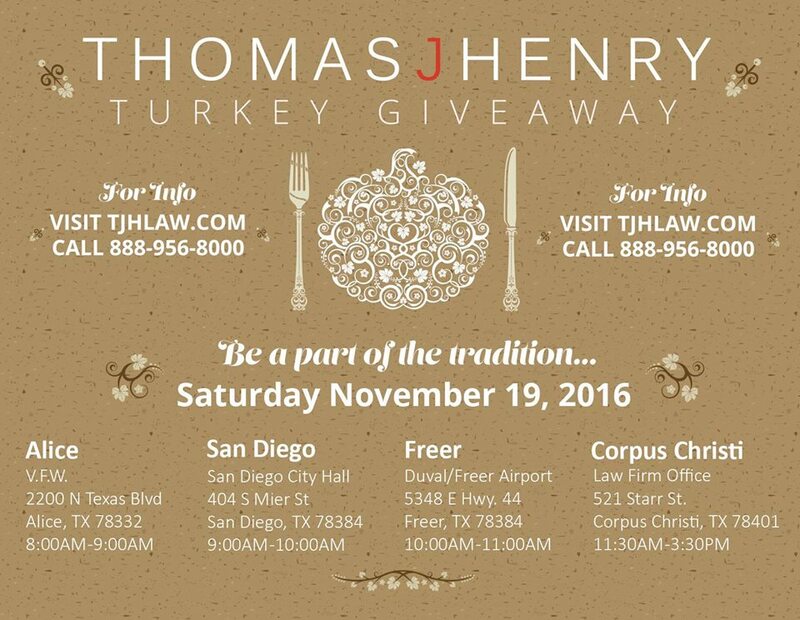 Register online or call to register 361-826-4667. Live Music! Lawn Games! Food Trucks! Families - enjoy time together, share a meal, and learn about each another through different fun events! Programming is held every other Friday night Curriculum is delivered by TAMUCC graduate students. Free movie in the park. Showing of the family-friendly movie, ‘Free Birds' his fun-filled animation movie is about the adventures of a turkey named, “Reggie” who was pardoned by the president. He joins forces with a fellow fowl, “Jake” so that all turkeys will never be in danger of becoming a holiday dinner. Bring your lawn chairs or blankets and join us for a wonderful evening under the stars. 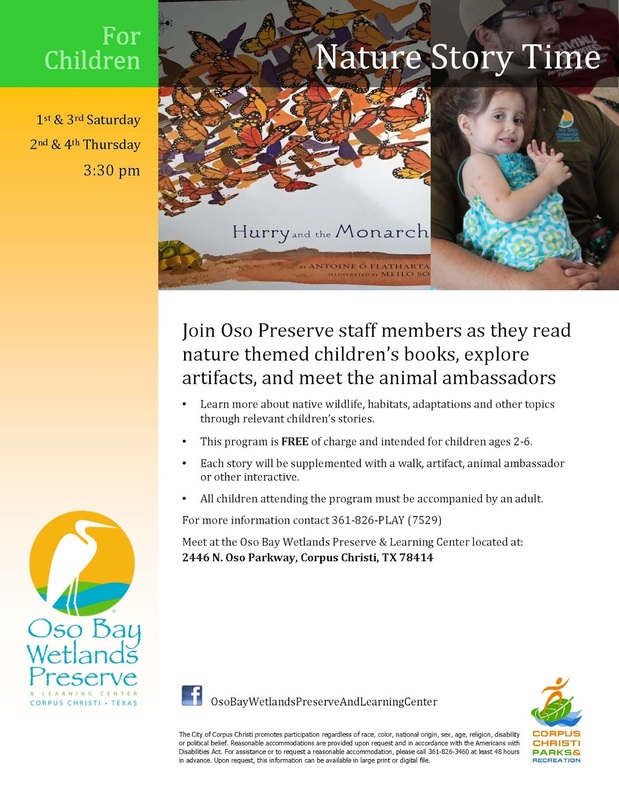 For more information call 361-826-PLAY. Tree lighting followed by Street Dance with Beau Walker. 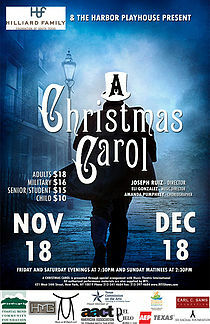 This timeless classic is a spectacular musical, which tells the tale of Ebenezer Scrooge as he goes through a series of strange events after being warned by his former business partner Jacob Marley to change his ways. This brilliant musical follows Scrooge on Christmas Eve, as he is visited by the ghosts of Christmas Past, Present, and Future, which leads him to ultimately discover the true spirit of Christmas. 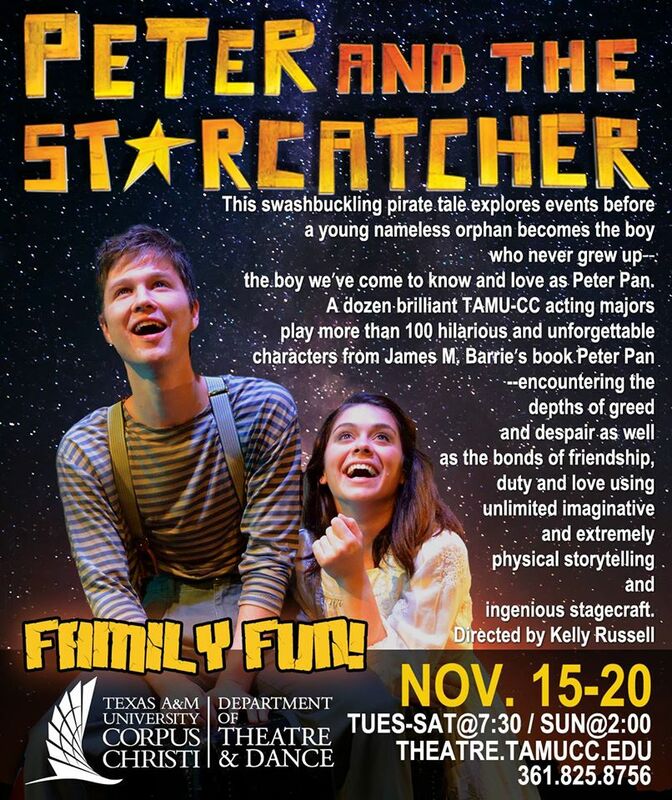 Peter and the Starcatcher is a swashbuckling pirate tale that explores events before a young, nameless orphan becomes the boy who never grew up – Peter Pan. Peter and the Starcatcher. A dozen brilliant TAMU-CC acting majors play more than 100 hilarious and unforgettable characters from James M. Barrie’s book Peter Pan. The characters encounter the depths of greed and despair as well as the bonds of friendship, duty and love using unlimited imaginative and extremely physical storytelling and ingenious stagecraft. Directed by Kelly Russell. 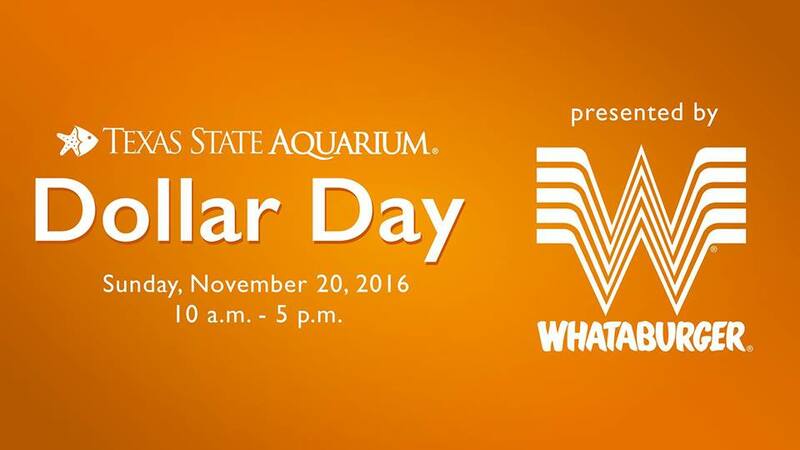 Cost: Tickets are $12 general admission, $8 for students, and $5 for TAMU-CC students paying with cash and a valid SandDollar$ ID. Tickets will be on sale one hour before show time or online. Corpus Christi Joker and Corpus Christi Dance Crew and Flashmob will be showing the kiddos Joker's flashmob dance and JuJu on that beat and eating pizza until it runs out! Enjoy a heaping plate of eggs, refried beans, biscuits and gravy, sausage and tortillas, accompanied by coffee and juice. Watch team roping demonstrations, re-enactors, musical entertainment, poetry and storytelling. Cost: $6 per person. Children under 3 are FREE! 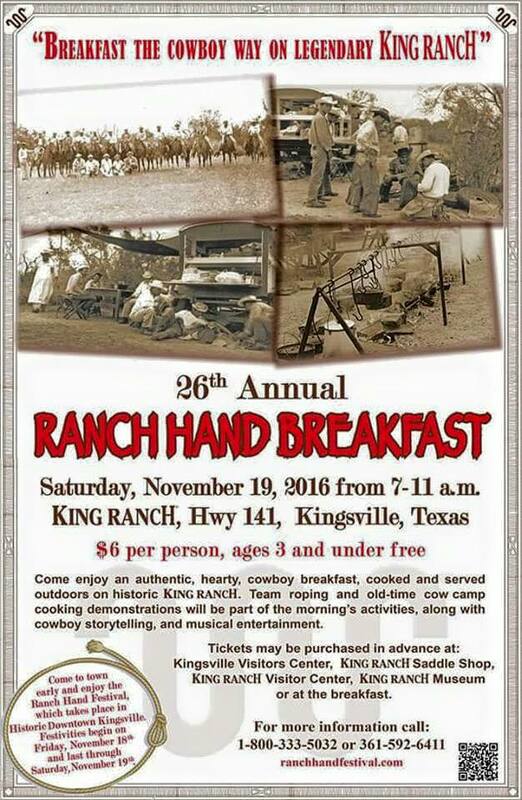 Tickets available at the Kingsville Visitors Center, King Ranch Saddle Shop, King Ranch Visitor Center & Museum. 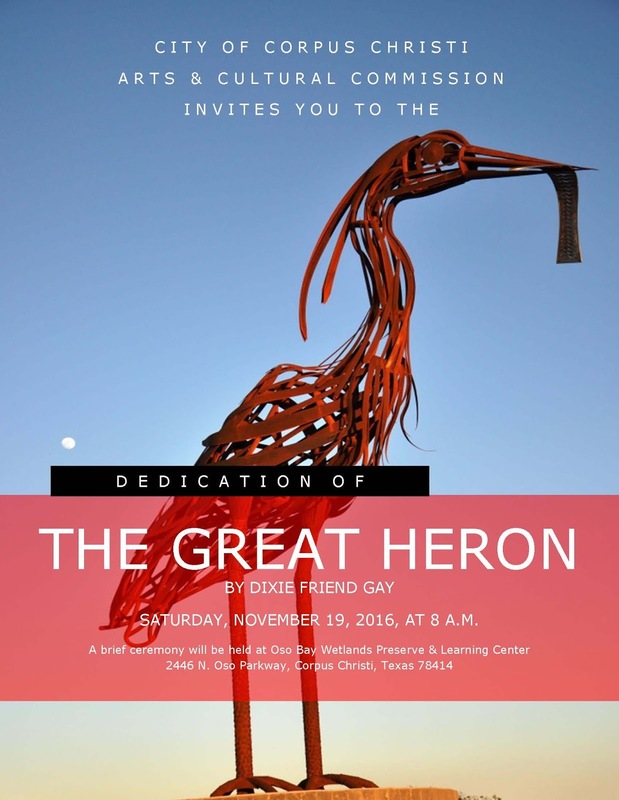 Art dedication of The Great Heron by artist Dixie Friend Gay at the entrance to the preserve. Afterwards, member organizations will have a variety of booths set up near the Learning Center to test your amazing outdoor abilities! Can you soar like a bird, sip like a butterfly, jump like a frog, or display other amazing outdoor talents? This event is your chance to learn about places to explore outside, stretch your legs, and enjoy nature. 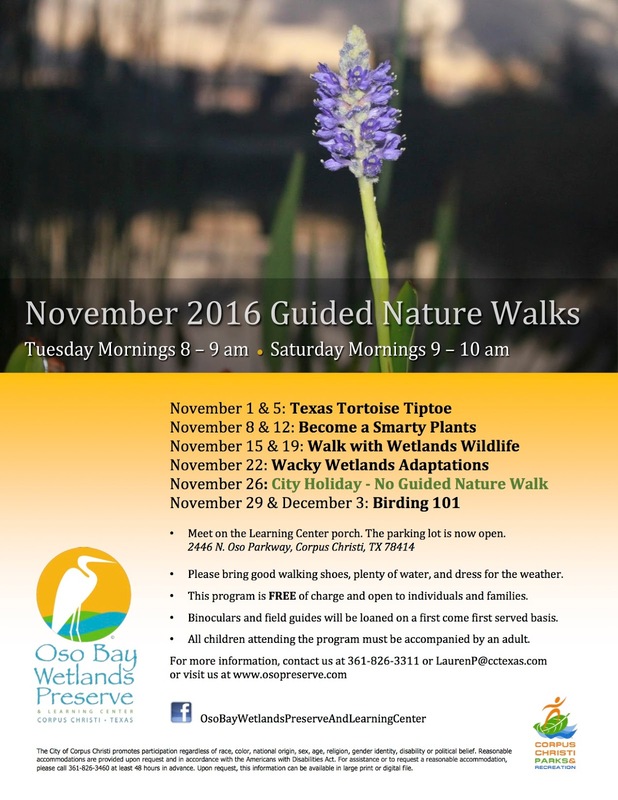 Local greenspaces, organizations, and nature lovers will welcome you and your children to learn how Nature Rocks! We invite you to test your abilities and learn about new places to explore nature. 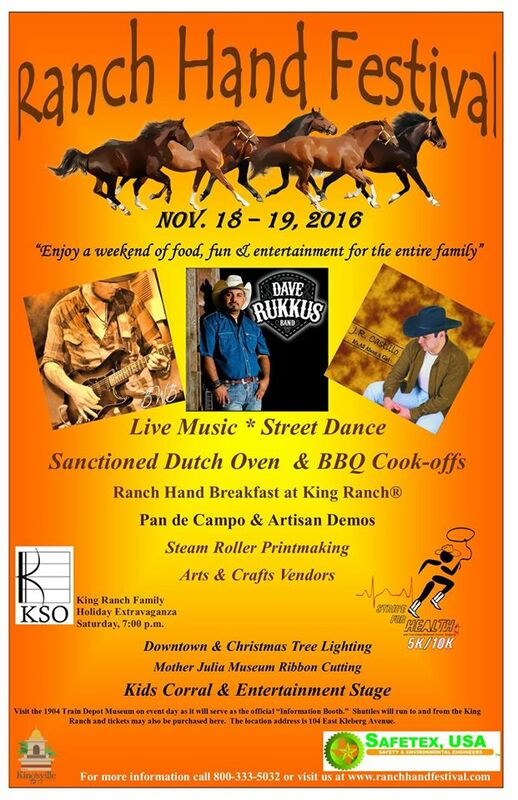 Oven and BBQ cookoffs, Pan de Campo and Artisan demos, Kids Corral and much more! A showcase of Christmas trees at the Art Museum of South Texas decorated to mirror children’s books chosen by participating schools. Participating schools will decorate their trees to be displayed at the museum during regular business hours. Tamales, Tamales, Tamales... It's all about the Tamales! 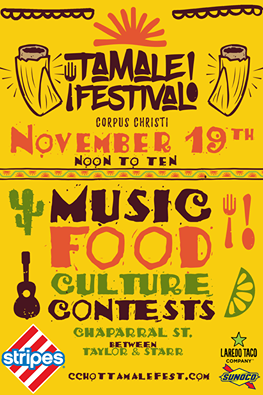 The CC Hot Tamale Street Fest will be showcasing South Texas' best tamales. The festival will showcase the beautiful Marina Arts District of Downtown Corpus Christi. 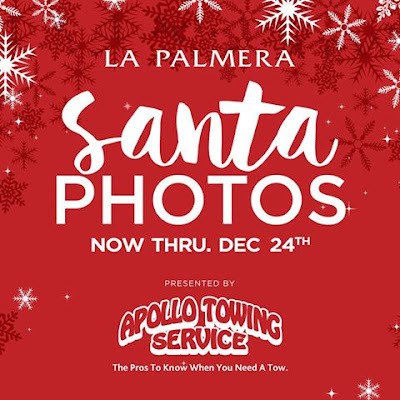 Food, contests, children's talent show, live music and more. 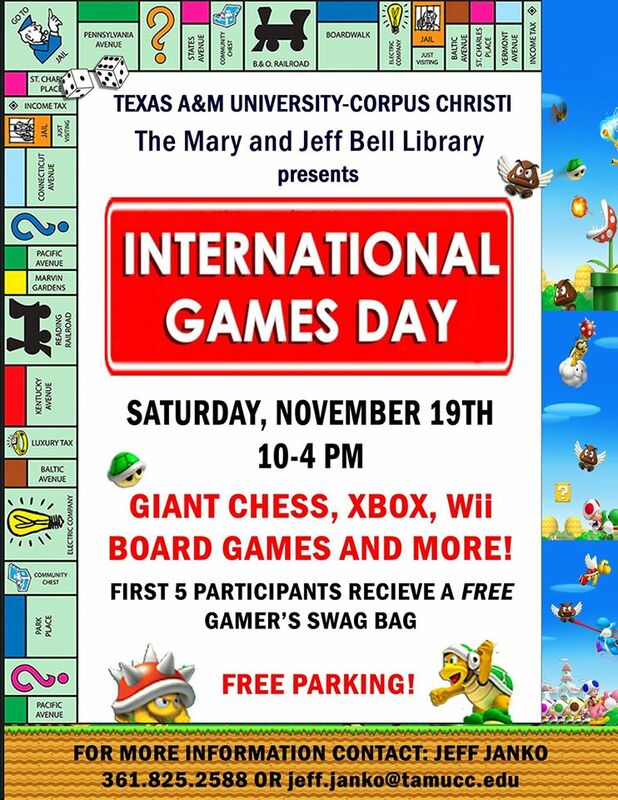 Join us in celebrating International Game Day. We will have all types of games from chess to role playing games. Bring a game you would like to share if you want. They craft, you shop! 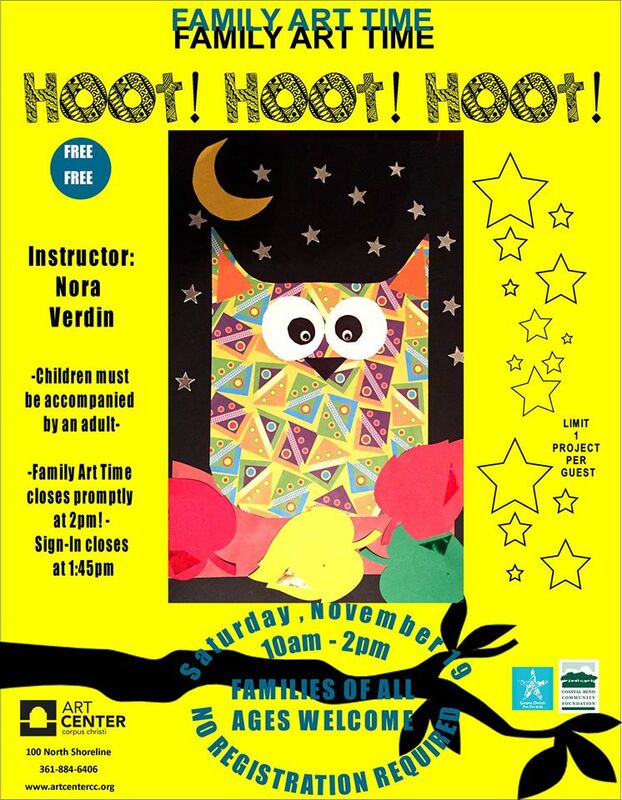 Kids 3 and up can enjoy a quick project and take home a finished masterpiece. Sign up in store or online, or just drop in. $2 per project, supplies included. Parent or guardian must remain on premises during the event. Enjoy some hands-on family crafting! 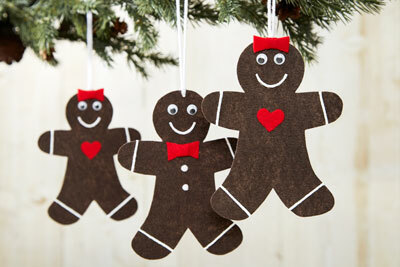 Grownups and kids will work together to design and create colorful thumbprint ornaments. 4717 -E S Padre Island Dr. 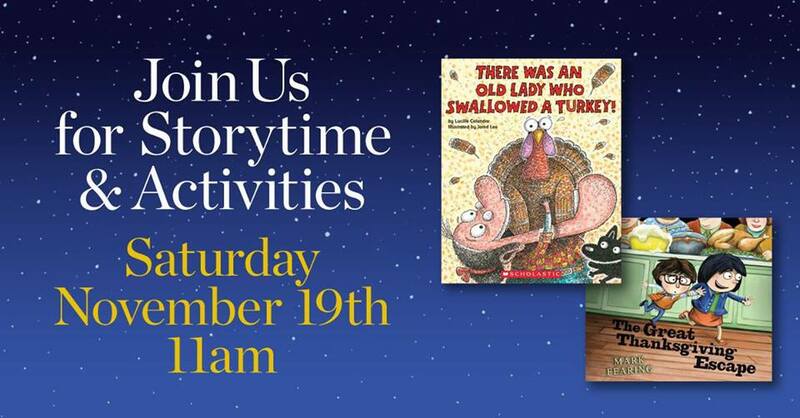 In celebration of Thanksgiving we will feature two special stories, There Was an Old Lady Who Swallowed a Turkey! and The Great Thanksgiving Escape. Coloring and activities to follow. 5129 Blanche D Moore Dr. This year they have an expanded kid’s zone with an inflatable sports challenge and carnival games. Face painters, balloon twisters, and clowns. Santa and Mrs. Claus and the elves. A kid-friendly petting zoo. Music, popcorn, and much more! Go on a scavenger hunt in our LEGO shop to get a FREE LEGO Star Wars Minifigure! Event intended for ages 6-up. Parental supervision required at all times for minors. All giveaways and event materials available while supplies last and distributed to participants only. Limit one per customer. Quantities limited; no rain checks. Corpus Christi Concert Ballet will perform a selection from their version of "The Nutcracker". You may bring a camera to take a picture with the ballerinas. Every child who attends will receive a FREE new book to take home. Limit one preselected new book per child while supplies last. Plus, for every book purchased online at HPB.com on Saturday, November 19, Half Price Books will donate a book to the nonprofit organization Feed the Children. Booksgiving Day is part of the Half Price Books Million Book Donation Project. Families and friends come together to share an afternoon of laughter and competition using table top games and tablets. Peter and the Starcatcher is a swashbuckling pirate tale that explores events before a young, nameless orphan becomes the boy who never grew up – Peter Pan. Peter and the Starcatcher. A dozen brilliant TAMU-CC acting majors play more than 100 hilarious and unforgettable characters from James M. Barrie’s book Peter Pan. The characters encounter the depths of greed and despair as well as the bonds of friendship, duty and love using unlimited imaginative and extremely physical storytelling and ingenious stagecraft. Peter and the Starcatcher is directed by Kelly Russell. Cost: Tickets are $12 general admission, $8 for students, and $5 for TAMU-CC students paying with cash and a valid SandDollar$ ID. Tickets will be on sale one hour before show time or online. Cost: Regular admission prices (3-64) $10.00 + tax, Seniors (65+) $ 8.00 + tax, Children 2 and under are free! Cow train ride is $1. Ticket booth closes 30 minutes before posted closing time. Come out to The Shape for an afternoon of fun for the whole family! There will be games, apple picking, pumpkin painting, a bounce house, refreshments and more! 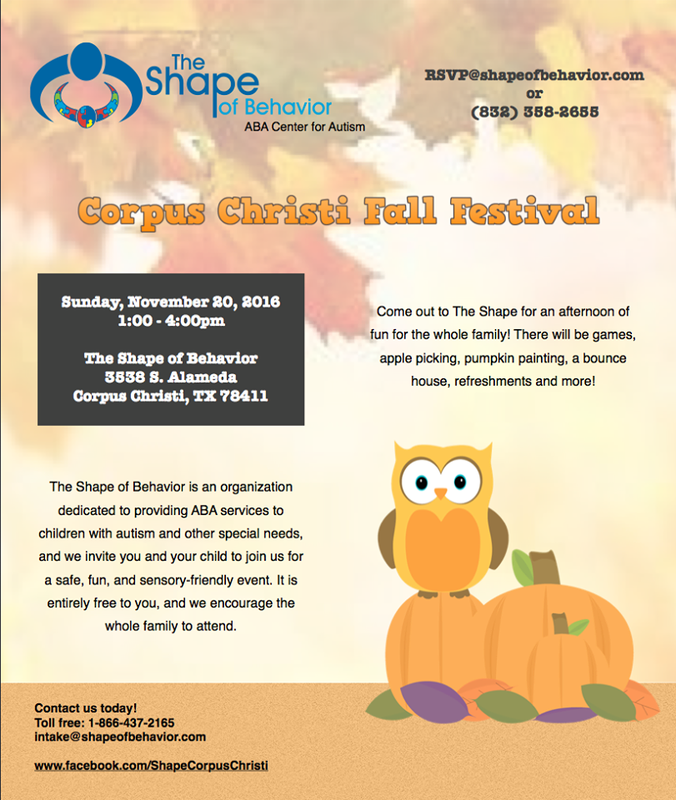 The Shape of Behavior is an organization dedicated to providing ABA services to children with autism and other special needs, and we invite you and your child to join us for a safe, fun and sensory friendly event. Receive a FREE Electabuzz foil card, Pokémon TCG collector's album & Pikachu poster on 11/20! Plus, get there early and the first 50 attendees will receive a free Pokémon figure! Event open to kids ages 6-up and adult collectors. Parental supervision required at all times for minors. All giveaways and event materials available while supplies last and distributed to participants only. Limit one per customer. Quantities limited; no rain checks. 1220 Airline Rd.